I was intrigued to see the pinterest board for a new Tilly and the Buttons pattern has over half a million followers. What is going on here ? Apart from the power of social media advertising. As well as the relaxed comfort for nearly everyone, for the 50% of us with no defined waist it’s an easy way to wear a skirt. There are many patterns for small children. But surprisingly few for adults. I thought I’d have a look around. I only found 3 patterns, and chris at makeandwear has pointed out another. But this style is ‘hot in the shops’, so no wonder a specific pattern is popular. No obvious technical term to label this style. 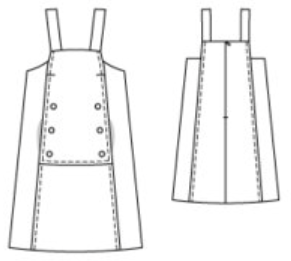 The UK patterns are called ‘dungaree dress’. The US patterns are called ‘overall jumper’. 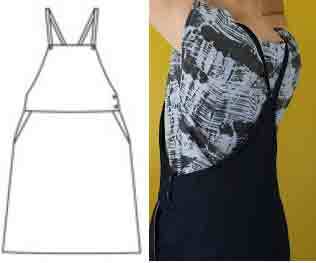 There’s recently been a free pattern with UK ‘Simply Sewing’ magazine, and they call it a ‘Scandi style pinafore dress’. A ‘jumper dress’ generally means a sleeveless dress which could be worn alone but is loose enough to wear as a layer over blouse or knits. The designer of this one calls it a “pinafore overall dungaree dress” ! 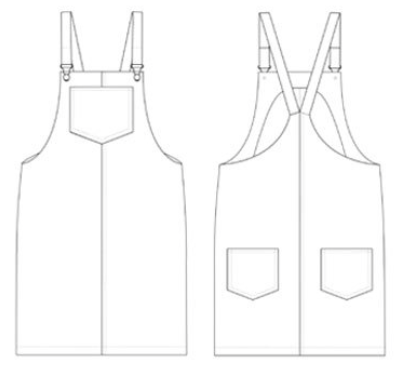 While in this post overalls / dungarees just have support from a bib and straps, not fabric coverage under the arms above the waist. Basically you’re unlikely to see these bibbed skirts worn without something underneath ! Though of course overalls / dungarees can also mean the wrist-to-ankle coverage of full protective workwear coveralls, often just called jumpsuits for women. I have fond memories of the very tough one I inherited from my father, worn for painting the bottom of boats. Many jumpsuit patterns. On a quick look I’ve only found a couple of true coveralls patterns, Kwik Sew 3389 and Lekala 6037. A jumpsuit with shorts rather than pants is called a ‘romper’. Have just discovered, from the newest range of McCall’s patterns, that shorts with a bib and straps are called ‘shortalls’ ! I don’t think I’ve missed anything just because I didn’t use the right words ! Some simple ways of making your own pattern, if that’s what you enjoy. 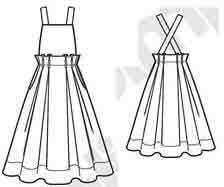 Add a bib and straps to a skirt pattern. Here’s a detailed tutorial for adults from Eggs and Daisies. There are some bibbed patterns with pants, so simply convert one of those to a skirt, as in this image. 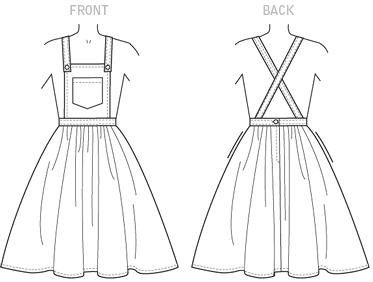 Here are some patterns to try that on : Burda 06/2014 #106, Burda 07/2016 #109, McCall’s 7547, Named Clothing Ronja dungarees. But what about the many of us who love sewing and loathe pattern work. Here are 4 bibbed-skirt patterns in print. All have usable pockets. Kwik Sew 4138 with back zip, includes pants (tissue, bust 31 to 45 in.). 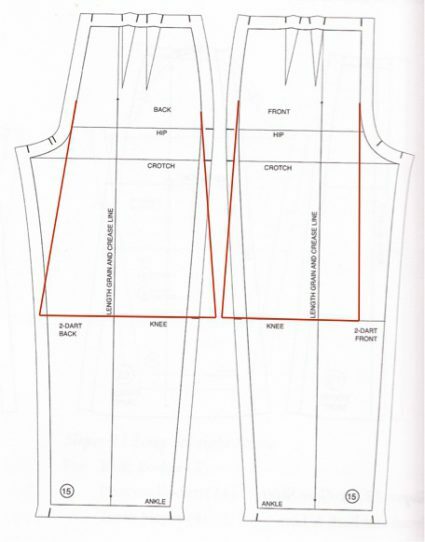 Marilla Walker, Roberts with side buttons, includes pants, and a top to wear with them see photo (download pdf, bust 31 to 49 in.). with some extra sewing tips here. This pattern from BurdaStyle has a back zip – those buttons are decorative. This is between bib and jumper – does have some fabric under the arms, but probably not enough to be decent for most people. Burda 10/2016 #117 (download pdf, bust 31 to 38 in.). Four very different styles – pretty, casual, classic, edgy ? I could wear a midi/maxi version of Marilla Walker’s design – which would you pick ? I haven’t seen the instructions for any of these patterns, but from other experience with these brands I expect they go from most helpful to minimal in the order : Tilly and the Buttons, Kwik Sew, Marilla Walker, BurdaStyle. January 2017. Here’s a new one from Mimi G, Simplicity 8301, with wide-leg pants and knit top included (tissue or download, video tutorial, bust 30 to 46 in.). Here’s another one, with exposed zip pockets, from Kommatia patterns (pdf, bust 31-41”). 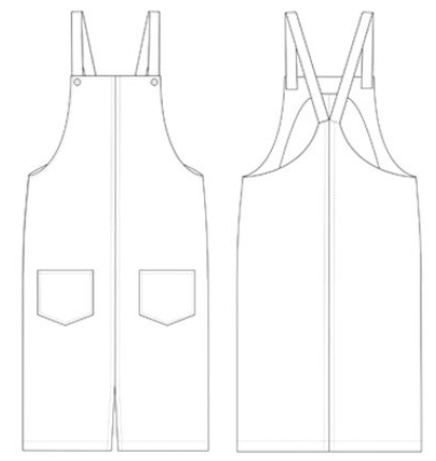 They have another pattern with bib patch pocket. You haven’t got to do double rows of topstitching if the thought makes you shudder (as it does me, not either my style or a technique I can do well). Or make it in denim.